Manufacturer of a wide range of products which include rotogravure printing inks. Rotogravure Printing Inks AQUA GRAVO W-QS (Water based gravure ink medium) is formulated for gravure printing on absorbent substrates. They are characterized by their ability to provide high quality prints and maximum brightness over any type of paper substrates. AQUA GRAVO W-QS is self cross-linking Acrylic co-polymer emulsion. It has excellent thermal and mechanical stability, which gives it superior running properties. It has a special acrylic system, which gives good wet rubbing fastness. High color strength at low viscosity. Rapid drying by absorption into the substrate. Can be formulated for low slip, enhanced rub product resistance. 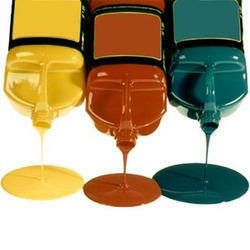 Water based gravure inks are used for wide variety of application. Choking problems are not visible even in long and continues run.